Whether you wish to buy a show lodge, choose your own plot for an individual design tailored to your own specification, or buy a pre-loved lodge, Mullacott Park is the ideal location for you. There are several styles and numerous floor plans with prices ranging from £99,950 to £249,950. You may be considering an investment purchase, in which case we can offer Guaranteed Rental Income packages, or you may simply want a holiday home in this prime location where you can escape from the hustle and bustle of everyday life. The park is open 365 days a year, so you are free to come and go as you please. What sets our lodges apart? Besides the emphasis on bespoke design, our lodges are unique in one other very important aspect – QUALITY! 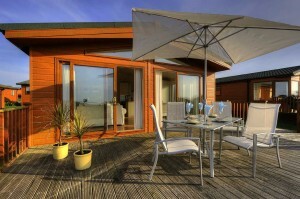 Mullacott Park is home to some of the highest quality built lodges in Europe. Quite simply, they are built more substantially than those offered by other manufacturers and parks. Each holiday lodge is traditionally built by craftsmen and time served joiners, exceeding BS3632 residential standard and NCC specifications. Using thicker treated timbers and adhering to stringent requirements with regards to sound, thermal insulation and U-value, our lodges are also extremely energy efficient. With a choice of either two or three bedrooms in your Luxury Lodge, you can decide if you would prefer the extra space created by having two bedrooms or the practicality of having three. The Lodges are up to 22ft wide and 42ft long. Prices start at £149,000. The VIP lodges are our most prestigious at Mullacott Park, located on our prime plots with panoramic views. The Mini Lodge is our newest creation, proving that great things can come in small packages! Built to the same exacting standards as the full-sized lodge, the mini lodge is a slimmed down version, cleverly designed and still able to incorporate two bedrooms and two bathrooms. Sleeping up to 4 people, this lodge is an ideal retreat for smaller families and couples. The mini lodge is 14ft wide and comes in a variety of lengths from 37ft to 40ft. Prices start at £99,950. The main benefit of this ‘starter lodge’ is that you will be buying the same quality as the larger units and therefore qualify for the 99-year licence.